I’m honestly not sure how to begin describing an event that was probably one of the strangest but most brilliant I’ve experienced. It started with a seven course set menu and ended with a man standing on a table playing a saxophone along to house beats in the middle of a bar. Sounds fun, doesn’t it? 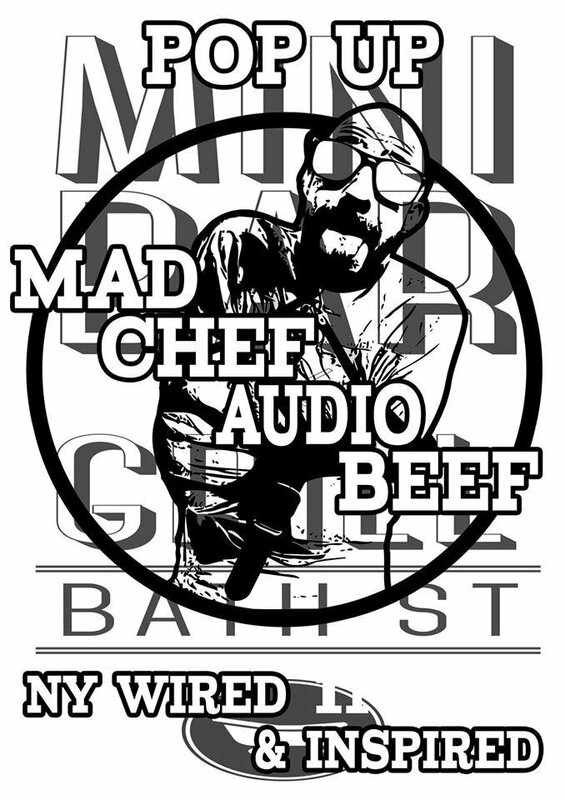 This pop-up street food event was created by ‘Mad Chef’ – the resident chef at Bar Bloc on Bath Street. For the first time, he decided to create a New York inspired evening of street food, music and fun! The event was hosted by Mini Bar, a tiny, club-like venue that squeezed around thirty people in for this incredible event. I managed to bag free tickets from Yelp Glasgow – which you should definitely check out – and I am so happy I got to experience what was a truly awesome evening of food and music. The first two courses came as one, consisting of Smoked Corn Chowder and Mad Falafel – fried falafel balls fused with coconut and peanut butter. The chowder, which I didn’t expect to like, was salty, smokey and filled with chunks of soft potato and pancetta. The falafel balls were a huge hit with everyone, containing whole peanuts – no processed peanut butter here! Served in street-food style cardboard trays, the food tasted and felt authentic, even the salad garnish was delicious! The next course we ended up waiting quite a while for, but the atmosphere of the place was fantastic and a big screen in the bar was linked to a camera in the kitchen which showed a massive set of decks in the middle of the kitchen, with Mad Chef bouncing around trying to get everything done. When the next course did come out, it was worth the wait, thought not for the faint-hearted! It was the ‘Park Slope Patty’ – a beef patty with salted caramel, habanero puree, caramelised onions, American cheese and the usual relish. I think it was pretty brave he decided to serve such a spicy burger as so many people just don’t do chilli, and this was pretty hot! The great thing was, though the habanero puree was hot, the other elements of the burger helped tone it down and the sweetness of the salted caramel & onions complimented the spice perfectly. Next up, the Vendor Dog, which was one of my favourite courses but also by far the messiest! A little hot dog in a mini brioche bun with fried chilli onions and classic ketchup & mustard. So much flavour in such a little bun! The final savoury course was the Cuban Pork Taco – pulled pork on a tortilla with wedges of fresh orange, lime and a dollop of sour cream. The pork was succulent and delicious and the zesty freshness of the citrus fruit was inspired! The desserts were soon whizzing their way round the room, starting with mini strawberry meringues and home made honeycomb. The honeycomb was fantastic and the meringues were certainly not mini! They were quickly followed by the final course – ‘Hubba Bubba’ bubblegum ice cream with popping candy. It really did taste like hubba bubba and the little flecks of popping candy added crunch and a bit of fun! By this point it was 11.45pm and I was fit to burst, but the night was far from over! The Mad Chef himself came out to say hello and thank us – using as many profanities as humanely possible – and to let us know that soon, a live saxophone player would be standing on a table in the middle of the room, playing along to the dance beats still coming from the decks in the kitchen. Well, that’s one way to end an evening! Just after midnight, with the sound of saxophones and swearing lingering in our ears, we piled out of Mini Bar and headed home. Mad Chef did a fantastic job creating an inspired and delicious menu, all the while mixing tunes and keeping his guests entertained. I can’t wait for the next one!